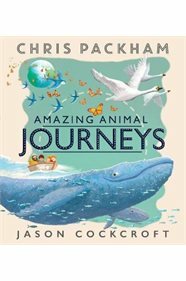 "A beautiful, fact-filled picture book by naturalist and TV presenter Chris Packham. Stunningly illustrated by Harry Potter cover artist Jason Cockcroft. Every year billions of animals migrate from one part of our planet to another. Travel around the world to meet some of the masters of migration as they take you with them on some incredible journeys. From whales and wildebeest to butterflies and bats, discover each of their stories, pore over the migration map and uncover extra information in the Find Out More section. An excellent source of expert wildlife information for all young nature lovers, this animal book is the perfect introduction to the natural world for children and anyone who loved Just Ducks or Tiny: The Invisible World of Microbes. Chris Packham presented the BBC's children's series The Really Wild Show before setting up his own TV company and making wildlife shows for ITV, National Geographic, Animal Planet and the BBC. Jason Cockcroft is an award-winning illustrator best known for his internationally acclaimed children's picture book illustrations and his cover artwork for the final three Harry Potter books."